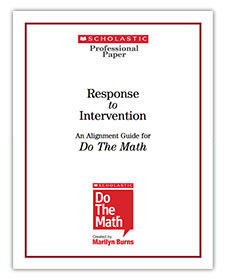 Do The Math is a research-based math intervention program that is proven effective in raising student achievement and increasing student confidence. 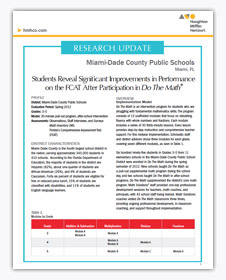 In 2012, our Research Department conducted a study in the Miami-Dade County Public School District to document the impact of implementing Do The Math with struggling students in Grades 3–5. Students showed significant improvements on SMI testing, which suggests that students made connections to grade-level content as a result of their work with Do The Math. Do The Math students were more likely than their counterparts at the same schools to show growth on the 2012 math FCAT. Teachers and administrators overwhelmingly agreed that Do The Math improved their students' confidence and overall understanding of math. 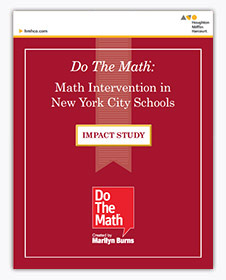 In 2008, our Research and Validation Department collaborated with independent research consultants to conduct a study in six New York City Schools on the impact of implementing Do The Math.